Immunogen Purified recombinant fragment of human KLF4 expressed in E. Coli. Kruppel-like factor 4 (gut),endothelial Kruppel-like zinc finger protein. May act as a transcriptional activator. Binds the CACCC core sequence. May be involved in the differentiation of epithelial cells and may also function in the development of the skeleton and kidney. KLF4 is highly expressed in the epithelial cells of the skin and the gastrointestinal tract. 1. Mol Cell Proteomics. 2008 Mar;7(3):499-508. 2. J Cancer Res Clin Oncol. 2008 Aug;134(8):891-8. Figure 1: Western blot analysis using KLF4 mAb against HEK293 (1) and KLF4(AA: 2-180)-hIgGFc transfected HEK293 (2) cell lysate. 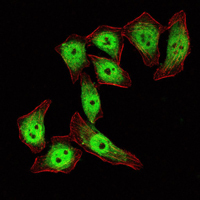 Figure 3: Immunofluorescence analysis of ECA109 cells using KLF4 mouse mAb (green). Red: Actin filaments have been labeled with Alexa Fluor-555 phalloidin.